Ball's work is, in many respects, similar to many photographers of the time — with two exceptions: He clearly understood light, and used it to great advantage to create subtle contrast. Also, his portraits suggest an eye for composition. 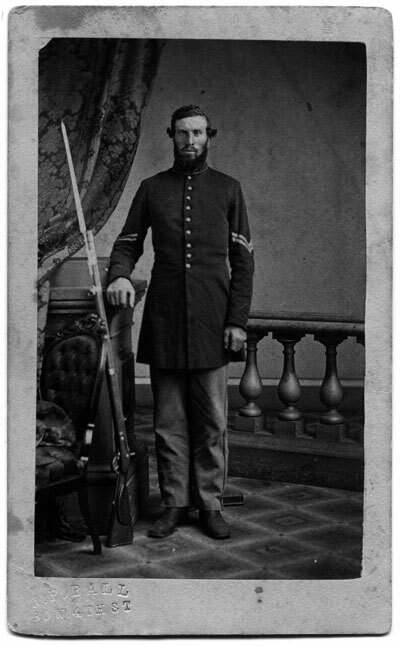 In the carte de visite of the unidentified infantryman, for example, the musket resting against the column creates a diagonal element that compliments the ever-so-slightly angled railing, curved drapery and chair, and creates balance between the strong vertical lines indicated by the column and figure. If you imagine the scene without the chair, and with the soldier grasping his musket (an approach most photographers might have taken), the image becomes less interesting. The lighting, from the subject's left, creates a fine contrast on his face. The light has also caused a glint on the bayonet and upper half of the musket, emphasizing the subject's military connection. In combination with the simple uniform coat, unadorned by decoration (save his corporal's stripes) or accoutrement, the image informs us in a nuanced way that this is an amateur soldier — a volunteer — rather than a professional soldier. This is my first year attending the annual Daguerreian Society symposium, and I've enjoyed it immensely. Held at the National Portrait Gallery in Washington, D.C., it has provided me with an opportunity to catch up with old friends, make new acquaintances, and put faces with names previously familiar to me only by email and eBay. Of particular interest was author Joe Bauman's account of the eight Daguerreotypes of Revolutionary War veterans he has collected, and the research he has done about their military service. Bauman and I share the same excitement for the powerful combination of photographic portrait and life story. I also enjoyed the group Daguerreotype, taken from a second story window in the NPG courtyard. The light was not bright, and so the camera operator called for a two-minute exposure. This gave me a real sense of what it is like to have to remain absolutely still for what seemed like an eternity. He made three plates, and I'm interested to see the results.